Recipe makes 8 "ears of corn" with 24 cupcakes. Preheat the oven to 350°F. Line a cookie sheet with crumpled foil. Cut the phyllo sheets crosswise into 3-inch-wide strips, tapering both ends. Drape the stacked husks on the prepared pan, shaping them over the crumpled foil to make curves. Spray lightly with vegetable cooking spray. Bake until the phyllo is golden brown, 4 to 5 minutes. Transfer to a wire rack and allow to cool completely. The husks can be made up to 1 day in advance and kept in an airtight container. Tint the vanilla frosting pale beige with the cocoa powder. Working with 3 cupcakes at a time, spread some of the pale beige frosting on top. Arrange about 5 straight rows of jelly beans, side by side and close together, on each cupcake. Try to select flavors that go well together, such as toasted marshmallow, banana, cappuccino, and chocolate pudding. Repeat with the remaining cupcakes, frosting, and jelly beans. 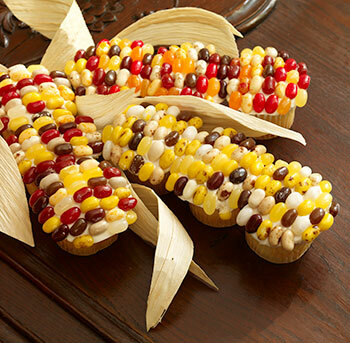 For each ear of corn, place 3 cupcakes end to end on a serving platter, aligning the rows of jelly beans. Arrange the phyllo husks on either side of the corn.